November | 2009 | Wait... What? Mobiles to teach real-world statistics? Saturday, was the last day of the 2-week Youth Empowerment through Arts and Media (YETAM) workshop with the youth. Each of the sub-groups had the task of prioritizing 2-3 areas that they wanted to focus on over the next 6 months and developing a basic plan. The plans included their focus issues, analysis of the causes of the issue, what they would do about it using their reinforced media and arts skills, when they would do it, and how they would know that they had achieved their short term goals (indicators). Photo: members of one of the media teams. · Music/Dance group: children’s rights in general, education as the key to a successful future, the value of local culture and traditions. · Media group: disaster risk reduction and risks to youth in the community such as the discotheque, alcohol and drugs, and violence. 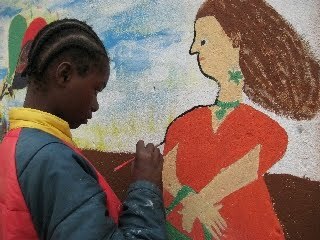 · Painting group: child rights in general, drug abuse and protecting children from violence/risk. 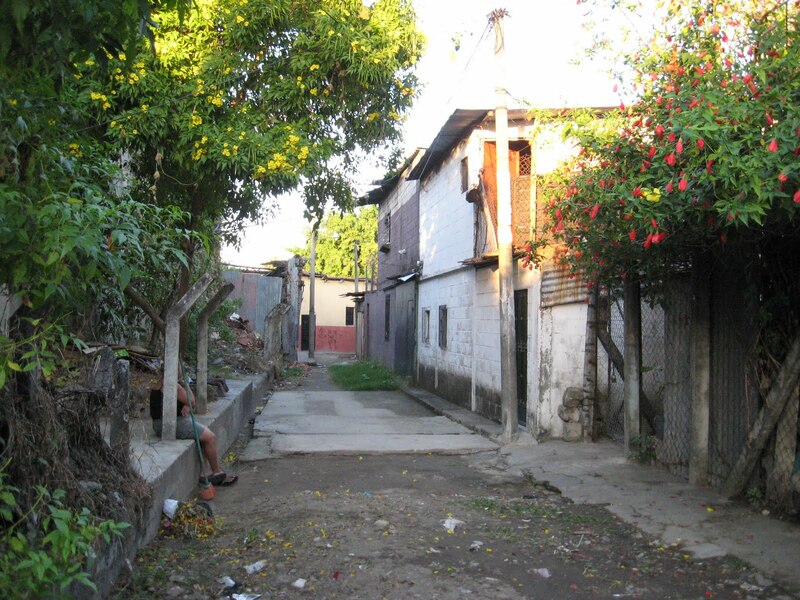 · Journalism group: sanitation and hygiene, education. 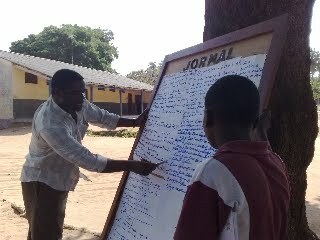 The groups will prepare work on these topics and extend their messages out to the school community and the surrounding villages. To track their progress, they plan to survey audiences that have seen their work (eg., their films, paintings, songs, theater, newsletters, etc). 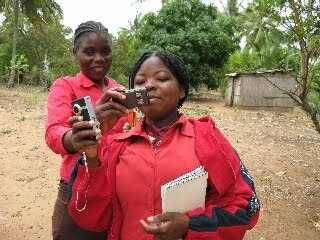 This made us think about the idea of using mobile phones to do the surveys (Nokia Data Gathering or Frontline SMS Forms, depending on which is more feasible and cost effective). 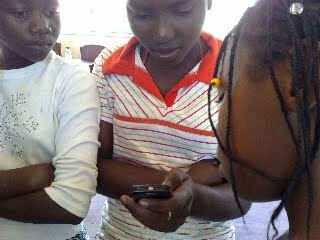 The youth could create surveys on a few devices, and then go around to survey people who have attended their events or viewed their work and heard their messages. The youth could then have immediate results by exporting the survey results into excel for analysis. 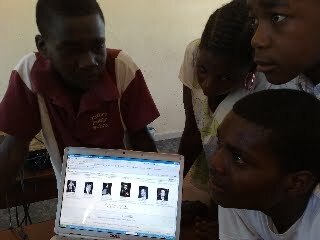 In the process, the youth can learn about statistics, charts and graphs. Eventually they could also take surveying to another level, such as looking at behaviors and practices, and use the information to inform the outreach work that they are doing. Photo: Thinking about mobiles for more than calls and SMS. Photo: journalism group shows their newsletter. It’s a light, it’s a bag, it’s a charger! It’s FLAP! 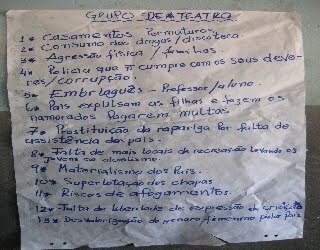 I already had a trip to Mozambique planned in November to facilitate a workshop with teachers, partners and youth as part of our youth empowerment through arts and social media (YETAM) project in Cumbana, a community about 30 minutes outside of Maxixe, and some 450 km north of Maputo, the capital. So I decided to get a FLAP bag and take it for a spin to see what people thought about it. Electricity to charge phones is of course not only an issue in Mozambique. 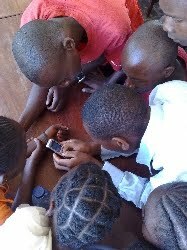 Last year some of the kids we worked with in Senegal made a video specifically about the chore of charging their phones. I brought the bag to the YETAM workshop one morning last week, removed the flap with the solar panels and laid it in the sun to charge. Jeremias, one of our project partners from Radio Mozambique in Maxixe, saw me setting it out in the sunniest spot and asked what it was. I gave the 30 second explanation: that it was a bag with solar panels, and it charges up a small light to use at night, and has a battery to charge phones. He quickly said – Oh! I can charge with my USB cable here, and showed me his phone. Then I had to rush inside to start the training. At break time, I discovered a little crowd gathered around the flap. Jeremias was crouched down, explaining to Badru (a journalist from Radio Progresso) and Joao (a journalist from Maxixe) how it functions. Photo: Jeremias explaining how the Flap bag works to Badru. So Jeremias and I did a short video interview of Badru, to see what he thought of the bag, how he would improve it, and if he thought it was something that could be sold locally (and for how much). “This is really a good idea. It would facilitate the lives of people in the communities. It has a light and a phone charger, that’s pretty essential,” he said. I asked what he thought people would be willing to pay for it. He stalled a bit, because he wanted to know first how much it cost to make and what the value in the US was. I said I didn’t really remember (true). He finally said for the bag alone, about $5. For the bag with the solar components, about $15. 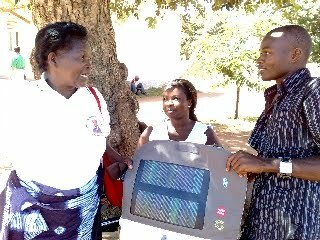 Joao stepped in and said that this kind of thing would necessarily be expensive because the technology is not available in Mozambique, where most technology like this is imported. In any case, I asked, how much would it be worth to someone to be able to have light in the evening and to charge a phone? How much do people spend normally to charge a phone? “Well,” Badru explained, “you have to send your phone somewhere to get it charged, or you have to go pay 10 metacais a day (around $0.30), and then sit around and wait for it to charge up.” So you end up spending about 300 metacais a month to keep a phone charged here. Badru thought the idea of making the bag locally and incorporating imported solar panels would be a possibility, and that a bag like the Flap bag would be helpful for university students, government staff or NGO workers who spend time out in communities and need to charge their phones up. Today Luisa, from the Casa de Cultura (Cultural Organization), Delcia and Eucidio (teachers at Cumbana school) asked about the bag, so I showed them the light and where the phone plugs in. I asked them what value a bag like this would have, and what they thought people would pay for it if it was available in the local market. Their first answer was that it would depend on how good the salesperson was, and that they would need to know what other similar products cost so they could barter. “This is something we haven’t seen before, so we have no idea what it would cost,” Eucidio explained. “But,” he encouraged Luisa and Delcia “look, it has light, it charges your phone, it’s a bag….” “Ooooouu, then it must be really expensive!” they concluded. 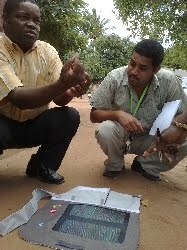 Photo: Luisa, Delcia and Eucidio discussing the suggested price for a flexible solar panel. Delcia doesn’t have electricity at her house and said a bag would be great because she would have everything at the home, and wouldn’t need to spend on candles or charge her phone outside of the house. I mentioned that I haven’t seen anyone here carrying a bag. People seem to use flimsy little plastic bags from the market or local store, or burlap sacks to carry vegetables, coconuts, etc., or they carry things on their heads. So where would it be best to actually put a solar panel? They thought a little, and suggested incorporating solar panels on backpacks for school kids, or on a hat, a shirt, back of a skirt, on a parasol, or as something that could be set on top of or in the back window of a car. 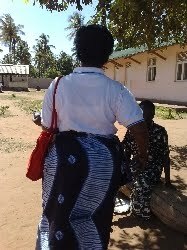 Photo: Luisa showing us where she could carry her solar panels: na bunda! Now as I’m sitting here in my little hotel room in Maxixe at the end of the day, across from the noisy gas station, slapping mosquitoes as I write this post up, I’m wondering if maybe the FLAP folks could add some kind of solar insect repellent to the bag…. That would be perfect. 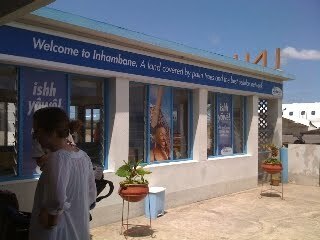 Landing in Inhambane, Mozambique, the first thing you see is the blue Vodacom sign: ‘Welcome to Inhambane – a land covered by palm trees and the best cellular network’. I don’t usually believe ads and this time was no exception. But I have to say, it seems to be true. My sim card is actually on mCel, not Vodacom, but the coverage is still damn good. And the two cell phone companies are everywhere. I’m not sure which I saw more of – yellow Frelimo t-shirts (elections were last week), yellow mCel kiosks or blue Vodacom kiosks. Which reminds me that I saw a statistic last week saying that more people have mobile phones than latrines. And I’m not sure how I feel about that…. And then I start thinking about the hierarchy of personal needs – which perhaps needs some revising. So does communication rank higher now than toilets? What about food? I was certainly more worried about getting online than about eating for the past 4 days (as a vegetarian, your choice is limited unless you really make an effort). I mean, at least I got to complain about the 4 days of fried eggs on Twitter…. but what if it were access to food in general? Where would I put my effort? hmmm. I digress…. My travel diet (in addition to the eggs) has been around 5 hours of mobile internet on my laptop a day (skype, email, blogging, Twitter, maps, google translate, and a few doses of Facebook thrown in), and several mobile internet snacks from my phone itself in between. I’ve gone through about 600 credits in 5 days, or around $4/day. I fully recognize that is expensive for someone who is not earning a US salary, but I love that I was able to just purchase a sim card, put it in my phone, hook up my phone as a modem, and ta-dah. Yes I’m using a ‘smart phone’ (Nokia E-63), but my point is that it’s much easier to use your phone as a modem in Mozambique than it is in the US (seems the latest i-phone update disables that so I’m afraid to download the latest update) or in the other African countries that I’ve been in over the past year. 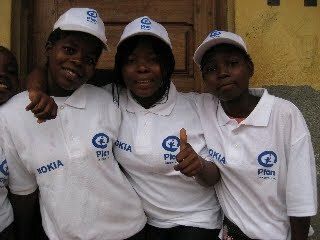 Compared to Cameroon, Senegal and Kenya where we had to purchase a special data package and get help/permission from the phone company (or were we just not doing it right? It does get easier to figure out the more you do this stuff). In any case, internet hardly worked once we finally got connected. 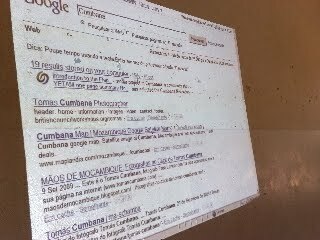 So in that sense, Mozambique is an internet junkie’s dream. I asked about internet as a precursor to the social media session of the Youth Empowerment through Arts and Media (YETAM) training of trainers workshop yesterday. We are working from a secondary school about 30 km outside of the town of Maxixe, where I expected internet would be nil (and it is, except by mobile phone modem). Several teachers and partner organization members from the area are participating. Starting on Sunday, for two weeks they’ll work with youth to use arts and media as tools in the community development process. The same arts and media are a way for youth to put themselves, their community and their issues on the global map by uploading the photos, drawings and videos they will make to the web. As an example during yesterday’s session, I Googled the name of the school. All we found in the first couple of pages was Maxixe and nearby towns listed, with content related to tourist beaches. 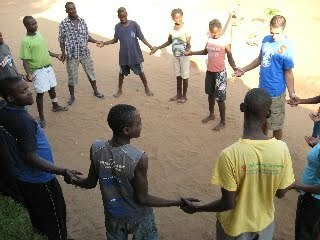 There was also a blog by Lauren, the Peace Corp Volunteer who is teaching there. Several months back when we were planning the training, Lauren’s blog was the only information I was able to specifically find about the school and area. Because of her blog, I was able to connect her and our local staff to work together on the whole training. After the YETAM training, the ideas is that people will be able to find information created by the community and youth themselves, from their own perspective. I’m really excited about the good internet, because maybe then the whole process can be done from the community – including the uploading and subtitling of the videos (usually is done from the Plan office in the US due to slow connections). That will be huge in terms of community and youth ownership. Im crossing my fingers that we can make this happen. Or we’ll have to sue the land of palm trees and the best cellular network for false advertising :-).